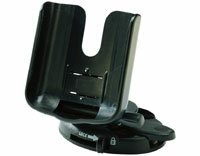 Garmin Automotive Mount for GPS 72, GPS 76 and GPSMAP 76 series (010-10305-00) €35.00 - buy online at mysatnav.ie - Ireland's leading GPS & Sat Nav store. This is a lightweight, portable and adjustable dash mount to hold your GPS72, GPS 76 or GPSMAP 76 series handheld in place. The bracket is hinged for best positioning and comes with a permanent and a temporary adhesive to attach the mount to the dash. For flexibility we recommend using the temporary adhesive.